Kindy's boasts a variety of Christmas decorations, including ones that are a little unconventional. The holiday season is upon us, so let's talk about Philly's one-stop shop for all things Christmas — Kindy's Factory Outlet. 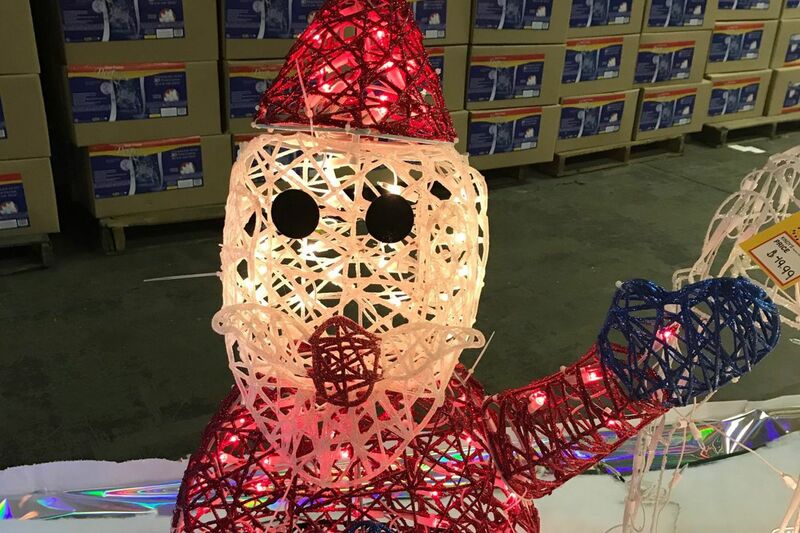 A South Philly staple that offers a huge selection of holiday lights, wreaths, decor, and flameless candles at cheaper prices than bigger retailers, it's not surprising that people often travel for miles to find the best deals on light-up Santas and holiday model trains. But hidden among the tangle of LED lights and impressive selection of stockings that look as if they've been in storage since the 1970s, there are plenty of Christmas-themed things that raise the question, "Who would buy this?" So if you're looking to turn some heads with your Christmas decor this year, look no further. Kindy’s boasts a variety of Christmas decorations, including ones that are a little unconventional. This Santa's camouflage pants made him stand out in a sea of Santas. This particular Santa was also carrying a fishing pole and wearing a Fair Isle sweater-and-hat set. He also only had one eye. Is this Santa actually a Santa or just a lumberjack masquerading as one in Kindy's home-decor aisle? The verdict is still out. Where you can find it: In the ornament aisle. The gingerbread man's face is frozen in horror. His candy button eyes are melting and his mouth reminded me of Edvard Munch's The Scream. There are even char marks painted on his body for maximum impact. If you're the person who would pay $10 for this and hang it on your tree, be prepared for lots of questions and weird looks. Where you can find it: In the ornament aisle. Also $10. Another mutilated ornament! This one looks as if it belongs in a Halloween store rather than a Christmas one, with its Corpse Bride vibes. But hey, if you're looking to do a mashup of these two very different holidays, this ornament might be the way to go. Where you can find it: In the outdoor-decor gallery. Who says your decor can't do double duty? This Santa could pass for a snowman dressed like an elf if you squint hard enough, thanks to the blending of beard and face, as well as the creepy doll-like eyes. Put this one out on your lawn this year and it could help ward off intruders. Where you can find it: In the tree room. To be totally fair, this particular product is not as weird as the others. I was mostly struck by the logistical difficulties of hanging ornaments on a palm tree. But if you're looking to add a beach vibe to your Christmas this year minus the sand or the sun, this tree may be just the finishing touch you need. 11 a.m.-8 p.m. on weekdays; 10 a.m.-8 p.m. on Saturdays and Sundays, through Dec. 20, 2900 S. 20th St.